The Indian Air Force has released an employment notification inviting unmarried males to appear in recruitment rally to join as an Airman in group X (technical) trades and group Y (non-technical) trades. Passed three years diploma course from a government recognised polytechnic institute with 50 per cent marks in aggregate, and 50 per cent marks in English in diploma or in intermediate/ matriculation. Airman Group Y: The candidates interested in applying for this post should have passed intermediate/equivalent examination in any stream/subjects approved by central/ state education boards with minimum 50 per cent marks in aggregate and 50 per cent marks in English. 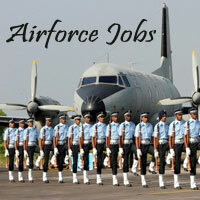 Airman Group X: The selected candidates will be getting a monthly salary of Rs 33,100. Airman Group Y: The selected candidates will be getting a monthly salary of Rs 26,900. The candidates will be selected on the basis of a written test, adaptability test-1, 2, physical fitness test (PFT) and medical examination. The candidates interested in these posts are required to bring all the required documents listed in the official notification at Rajiv Gandhi Government Polytechnic, Itanagar, Arunachal Pradesh on November 4 at 10 am.